I feel my most adult when all the flat surfaces in my home are clear, there is something good smelling cooking in my kitchen, and I have clean underwear. I achieved two of the three this weekend. I’m going to go for the third today. I may even wash my car and pay bills but that may be a bridge too far. Plus, no one likes a show off. Even though I am a fully paid up member of the Grown-up Club, I don’t feel like I’m grown-up enough. 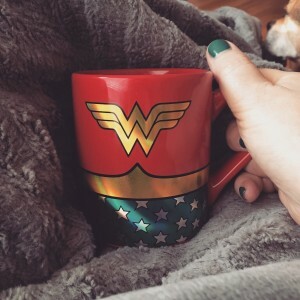 I remember my parents when they were my age and I know my mother did not drink her coffee out of a mug emblazoned with the image of a cartoon super hero. 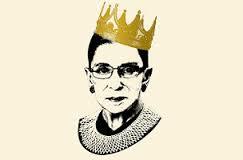 She didn’t wear t-shirts with the likeness of a Supreme Court justice wearing a hip hop crown. She didn’t listen to hip hop. My parents kept the yard mowed and the weeds pulled and the cars clean and the bills paid. They fired up the charcoal grill on Saturdays and made roast on Sundays. They were adults. I feel like an impostor quite a lot of the time, until I hang around a big group of young people. Hanging out in a bar, listening to loud music and talking to young people is the easiest way for me to feel like the most adult person that ever lived, also the oldest person. It has been twenty-five years since I vomited in the parking lot of a drinking establishment. It is never a good way to end a night. I get very cranky if I am not home and in bed before 11:00 p.m. Mornings go better when you sleep. I know it is not a good idea to get the name of a person tattooed on your body. These are all important life lessons. I’m so grateful for the five years I’ve had since I was diagnosed. I used to worry I wouldn’t get to see my daughter grow into her adulthood. At nineteen years old, she still had that teenager’s uncertainty on my general usefulness and intellectual capabilities. But I knew she still needed me and she knew it too, deep down. She is turning into such a fine grown-up, in her own right. I’m so proud of her. And I am still around to drop my solid gold nuggets of grown-up advice. Like, it’s a great idea to use ice cube trays to freeze the last of the wine to use later in sauces. And fresh nutmeg is the secret ingredient in sauteed spinach. Also, the best time to buy a new television is right before the Super Bowl. When wearing a skirt, bend at the knees, not the waist. I was concerned all of this good stuff was going to die off with me. It is important information to pass on to the next generation. I think I’m going to start keeping a list. Going at the top of the list will be a big disclaimer, maybe, that we all feel like frauds at one time or another. Even thought my parents still seem to me to be the most grown-up people I’ve ever known, I know they woke up many mornings unsure about their place in the world. We all walk around feeling like the zippers are showing on our grown-up suits. I’m going to go forth in my day, doing adult things, feeling not quite as grown-up as my idols but feeling better off than the guy who vomited his kidneys up in the parking lot and is this morning not sure why the wallpaper looks unfamiliar. But I’ll do all this grown-up business while wearing my favorite business casual super hero t-shirt.